The book begins by outlining the Polanyian theory of embedded, disembedded, and reembedded markets, and other approaches that Konings broadly categorizes based on their view of money as an idol—and thus treat it is an external object that interacts with distinct subjects in discernable, largely straightforward ways that needs to be and can be stopped. Included here, though the distinctions are acknowledged, are the disparate Marxian and Marxist understandings of commodity fetishism and false consciousness, which reductively treat money as an external holder of labor value and capital. Going further the book offers a very deep explanation of what it means to treat money as an idol (something that is granted meaning that becomes ‘worshipped’ on its own) versus viewing it as an icon (something that is part of a complex interconnection of signs that is imbued with meaning by and through the actants and complex networked relations that are not immediately visible, has no external transcendent meaning of its own, yet its significance is known immediately) (18-21). By continuing to treat money as an idol as it often the case in progressive and even more traditional Marxist streams, they overlook precisely what it is that makes the power of modern money and indeed modern capitalism so persistent and persistently defended. One of the vital contributions of Konings’ book is that he refuses to simplify the complexity and paradoxical nature of the iconic function of money, and yet the importance of this paradoxical existence is explicated clearly. This contribution is made even stronger by the third chapter which explores the social power and “secular sovereignty” that money possess as a—nay, the—central iconic sign of modern and contemporary capitalism. It is an empty desire that can be transformed by and transforms the subjectivities that are governed and disciplined by it (38-9). The next two chapters take this thesis and expand it in connection with an excellent genealogy of icons and the role that money takes on as a performative sign in our society. This is where Konings takes his reader, rather quickly, through the problems with using Saussurrean semiotics and the value of utilizing a Pierceian pragmatic approach. The advantage of the pragmatic approach versus the more often utilized structural semiotics, is that the power of the sign is made progressively more clear and though, as an icon it’s meaning remains contingent, money’s meaning is never left in the arbitrary state it would be if one deployed the structuralist explanation (54). Konings then carries this discussion through his genealogy of twentieth century economic theories, especially those related to progressivism. It is here that the main claim about progressivism’s self-defeating failure appropriately to understand the affective role that money as an icon plays in capitalism is brought forward. The back cover of the book tells the reader that Konings will attempt to revitalize the Marxist critique of capitalism through his affective-immanent analysis of money, capitalism, and the paradoxical role that progressivism has played in maintaining capitalism by producing itself as a scapegoat for failures of capitalism to live up to its (false) promises. The promises are false because progressive discourses take an elitist tone towards their disembedded interpretation of money as an idol, which requires an external infusion of morality in order for the liberal capitalist subject to be healed of the harms incurred by the consumeristic weaponry of capitalism. Progressivism, in short, overlooks the immense social and psychic power of capitalism to be affectively persuasive. While there is certainly a comprehensive analysis of capitalism and modern money, the engagement with Marxism, beyond the critique of commodity fetishism and false consciousness mentioned earlier, does not come until the last several pages of the book. While one never knows why certain things are emphasized on the back cover of books, this limited direct engagement with Marxism is the greatest weakness of the book. There is one exception to this weakness; Konings does have a strong engagement with some of the ideas articulated by early Frankfurt School thinkers Walter Benjamin and Erich Fromm, whom Konings skillfully connects in a way that I have not seen done in the existing literature on the Frankfurt School. With that said, I believe there was still a missed opportunity on Konings’ part. First, he doesn’t take the next dialectical step that his own analysis and immanent critique seem to demand. Money functions as an immanent producer of meaning and is co-constituted with capitalistic subjectivities. It is not external as the more traditional commodity-fetish understanding of money would seem to imply. As accurate as Konings’ interpretation of monetary-commodity fetishism is, he fails to articulate (or explain away) the possibility that in certain instances money does become or function as something external to us, while never being wholly external in the Polanyian sense. I would think that there is a potential productive dialectical merger of Konings immanent affective theory of money with the Marxist view of commodity fetishism, ideology, and false consciousness that was not pursued. Konings embraces, and indeed emphasizes various paradoxes throughout the book, yet seems to dismiss the possibility of this one. This is especially surprising given his rather lengthy discussions of Benjamin and Fromm, both thinkers he acknowledges appreciate the immanent power of money and capitalism more broadly in the production of affective discourses, desires and dually static and dynamic subjectivities. 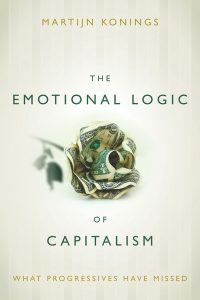 That potential opportunity aside, it is worth noting that for a book entitled The Emotional Logic of Capitalism, Konings never offers a definition of capitalism. Perhaps this is due to his post-structural bent which is pervaded by anti-essentialist and post-foundationalist demands; it nonetheless would have strengthened the book to have drawn the connection between the detailed discussion of money with a clearer, if still contingent and loose, definition of what capitalism is, or at least how Konings is using the term. As it stands, he seems to assume his readers know what he means and that their understandings are identical to his (whatever they are). It is here that the omission of the important work of J-K Gibson-Graham (2006) is most noticeable. Konings brings together a multitude of disparate thinkers, theories, and traditions to make his case, and yet the thinkers that have done the most work to develop a counter to the affective social power of capitalism through their work on affectively-potent economic communities that aim to expand the non-capitalist elements within the broader capitalist system, to destabilize the monolithic narrative of neoliberal capitalism, are not mentioned. It is easy to say that an author should have included other thinkers, no matter what book is being looked at, but in this case the absence of Gibson-Graham is unfortunate and substantively limiting. With that said, Konings’ analysis of capitalism is profound. It is original, sophisticated, and at its best, convincing. Though he concludes with reference to the neo-Marxist and post-Marxist thinkers he believes most adequately embrace the immanent-affective power of capitalism, he never indicates what we might do moving forward. How do we respond the immense affective power of neoliberal capitalism especially? Yes, its power is contingent on the performances of the agents involved, the discourses we are provided with as subjects are not entirely or even mostly ours to choose. Konings admits this throughout his discussions, and despite the fact that he does not indicate the path forward, I do believe the book itself points implicitly to at least one rather obvious ‘solution’. In order to move beyond capitalism the Left needs to not only better appreciate the affective power of capitalism, but construct alternative performances and spaces for those performances that offer the possibility to develop new affective ties to a better, more humane system—namely democratic socialism, broadly understood. Capitalism is reproduced not only through financial capital investments, but through psychic emotional investments by the subjectivities that are co-constituted with it. The Left needs to provide alternative avenues for productive and egalitarian affective investments that respond better to the demand that peoples’ traumas be healed and sustaining the belief that hope for redemption is possible in their lifetime—even if it isn’t. Konings’ book should be considered an indispensable tool in this project. Gibson-Graham, J-K 2006 A Postcapitalist Politics (Minneapolis: University of Minnesota Press).